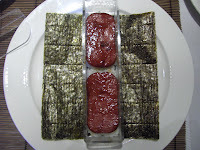 Have you ever had spam musubi before? I never had this until I met my husband. But now that I've acquired a taste for it, I'm hooked. So much so that I was craving it last night at 11:30PM. Now, I know what some of you are thinking, "spam, do you know what's in that???" But I swear this food is the best. I've witnessed party guests devour it without knowledge of its ingredients. So, if you're feeling daring or just curious the recipe is below. 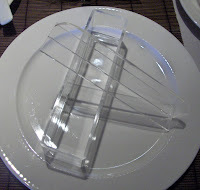 To get started you'll also need a spam musubi press/sushi mold. Oh yes, there's a sushi mold made especially for spam musubi. This is serious stuff. 1. Cook rice as usual and let cool. 2. Cut spam into 10-12 slices. In a a large frying pan cook the spam in the yoshida sauce so sides are coated with sauce (about 7 min). You want the sauce to thicken up. 3. 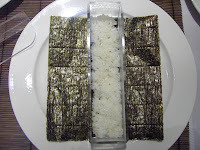 With the rough side of the nori facing up, place the mold on the center of the nori. 4. Fill the mold about 1/4 high with rice. Pack it down lightly with the top press. 5. Add two slices of spam. Cover spam with the same amount of rice that was added on the bottom. Press again. 6. Pull the mold off while holding the top press on it. Wrap the nori around the rice and spam. Turn over so the seam is on the bottom. It should now look like the picture to the left. *For easier cutting, run the knife through a lemon. This will prevent it from sticking. *The rolls can be wrapped up in plastic wrap until you plan to slice them. Do not place them in the fridge, this will make the rice hard. Spam musubi should me served the same day it's made. Despite the fact that I JUST ate dinner, I'm inclined to open up a can of Spam right now. By the way, I predict lots of hits to your site because of this post. Interesting! I haven't bought Spam in years (maybe 20?). I'd be willing to try it if I had the proper 'equipment' on hand. IMHO, that's the way it should be done with the nori wrapped around everything, not just the usual 1-inch strip of nori holding the contents together. 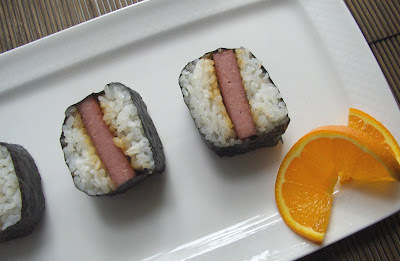 I realize the usual style is to showcase the spam or chicken but after a few bites everything simply falls apart. Nopes this is something new and fresh for me. I haven't had Spam for years now. Creative ideas. Alex, you've never had this, I can't believe it. Of all your post, I'm gonna have to say, Gag! Yes I admit spam smells wonderful frying in a pan but I can't for the love of god eat any, ok, maybe for a $100 bucks...but then for some reason it's only spam, where as I can handle salami, hot dogs and even liverwurst! Dare I ask if it can be made without the nori? I can't stand anything even remotely fishy-tasting, but I love rice and Spam and Yoshida sauce. When I was a kid, Junki Yoshida was my dad's karate sensei, and his sauce was just getting big. I always have a big costco bottle in the fridge. I grew up in Hawaii, so I am no stranger to spam musubis...yum! I'm hungry now! 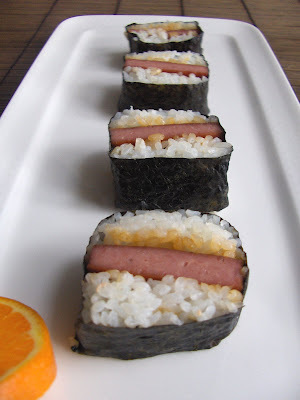 I saw a way you could make the spam musubi without the nori. Using a circle cookie cutter, cut out a cylinder of rice. With the same cookie cutter, cut out the spam and place it on top of the rice. I love spam musubi!!!!! Great tutorial! I have a musubi press thing but I hate CLEANING it. *drop in rice, slice of fried SPAM, and another drop of rice. I too grew up in HI. Spam Musubi was the best thing about school bake sales. 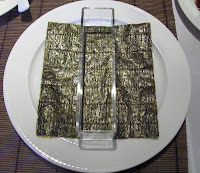 I agree about the full sheets of nori being better than the 1" strips. ...just browsing your old posts... I think you meant 'cooked rice' in your recepie, right? The rice seems to be cooked in the pictures.. I made up a batch of musubi for a New Year's Party tonight. I hope everyone enjoys their little "snacky" suprise. now I'm craving for this! yikes!!! !